The M. A. Chidambaram Stadium is a cricket stadium in Chennai formerly Madra), India, named after M. A. Chidambaram, the former President of BCCI and the Tamil Nadu Cricket Association. The stadium was formerly known as Madras Cricket Club Ground or Chepauk Stadium. Commonly known as Chepauk, its first match was played 10 February 1934. Built by the East Coast Constructions and Industries, this stadium is where the Indian cricket team won its first ever Test victory here in 1952 against England. It is the home ground of the Tamil Nadu cricket team and also for IPL's Chennai Super Kings led by Team India Captain MS Dhoni. The nature of the pitch at this ground is bouncy which offers something to both the bat and the ball in a country renowned for producing dry, low, spinning, flat wickets. In recent times, the wicket has got flatter. 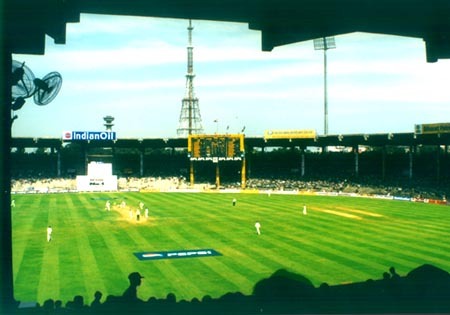 The stadium witnessed history when only the second tied test was played here between India and Australia in 1986, which included Dean Jones making a heroic 210, Greg Matthews taking 10 wickets and Kapil Dev scoring an excellent century. Another famous moment was Saeed Anwar's record 194 against India in the Independence Cup on 21 May 1997. The stadium also witnessed dramatic scenes when 50,000 fans gave a standing ovation to the Pakistan cricket team in January 1999 after victory in a very closely fought test match. The stadium was also selected to replace Mumbai in the test series against England after the Mumbai terror attacks on 26 November 2008.